The Watershed Protection Plan is intended to be a living document, and may be adjusted to include new data as well as modified as conditions in the watershed change over time. It will evolve as needs and circumstances dictate and will be guided by the Stakeholder Committee as they undertake active stewardship of the watershed. WHY IS THIS IMPORTANT? WHY WAS THE PLAN INITIATED? 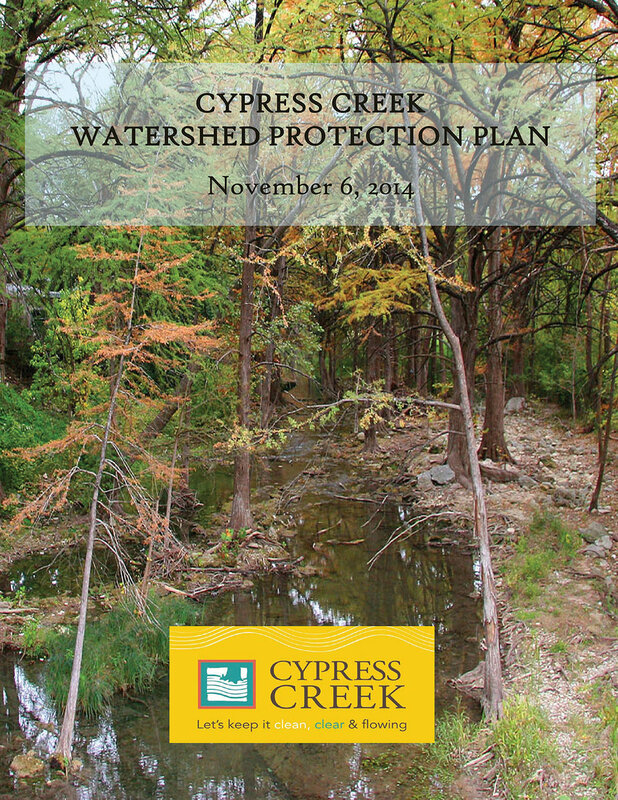 What is the cypress creek watershed protection plan? The Cypress Creek Watershed Protection Plan is a proactive plan that addresses likely future nonpoint source pollution impairments of Nitrogen, Total Suspended Solids and other water quality pollutants. In addition, the Plan seeks to reduce current water quality concerns related to nutrients, dissolved oxygen, suspended solids and bacteria. Efforts will focus on surface water quality, and the importance of properly managing source/groundwater. The community-approved Cypress Creek Watershed Protection Plan (WPP) is an important tool that can be used by the region’s leaders to help manage the Cypress Creek Watershed. The plan has broad-range support among the key governmental entities and local non-governmental organizations, has its basis in science, community involvement, and is adaptive in nature. The WPP includes a suite of best management practices (BMPs) to mitigate current and future potential water quality impairments. BMPs were prioritized for immediate implementation, while others will be implemented over a number of years, as needed. The community seeks to initially implement the plan through demonstration of best management practices from which they will learn what methods provide the most water quality benefits. The Stakeholder Committee also integrated an initial source water protection strategy with the goal to keep Cypress Creek flowing. Given that the quality of the water in the Creek is highly dependent on ensuring sufficient source groundwater flows, the preservation of flows from Jacob’s Well is a major component of this Watershed Protection Plan. This plan is significant because of its proactive nature, its engaged citizenry, inclusion of source groundwater for a complete hydrologic picture, and the implications for other potentially impaired watersheds in central Texas. Water quality in streams can directly affect water quality in the aquifer because of rapid recharge through karst features, such as fractures and sinkholes in streambeds. The reverse is also true where springs contribute to river flows. The health of the Creek is highly dependent on maintaining adequate spring flows, making recharge and groundwater management in the larger region critical to maintaining a healthy system in Cypress Creek. The Cypress Creek Project was initiated when concerned landowners, non-governmental organizations (NGOs) and the Meadows Center for Water and the Environment (MCWE) applied for state and federal 319 funds to develop a preventative and community-driven watershed protection plan (WPP) for Cypress Creek (Figure 1). The goal was to keep Cypress Creek from being listed as impaired on the 303(d) List of Impaired Waters, as it had been in 2000 for inadequate dissolved oxygen (DO) (segment 1815). That year, the Creek stopped flowing due to drought conditions, which negatively affected DO. When precipitation returned to average levels, the segment was delisted. Currently, water quality in Cypress Creek is meeting standards set by the Texas Commission on Environmental Quality. However, Cypress Creek has shown signs of water quality degradation in the recent past, and data revealed that there is a potential for degradation in the future if nothing is done now. Reduced Dissolved oxygen, erosion, Total Suspended Solids and bacteria continue to be significant issues in Cypress Creek and its tributaries.